Attaching solar photovoltaic (PV) panels to roofs with high-performance adhesives can not only substantially reduce the cost and complexity of installing solar it can keep buildings cooler and reduce air conditioning expenses in the summer as well says new research from the Fraunhofer USA Center for Sustainable Energy Systems CSE, an applied research and development laboratory dedicated to solar photovoltaics, smart energy-efficient buildings, and grid technologies. The new research was presented by Dr. Nitin Shukla at the TechConnect World Innovation Conference and Expo, held in Washington from May 14 – 17. 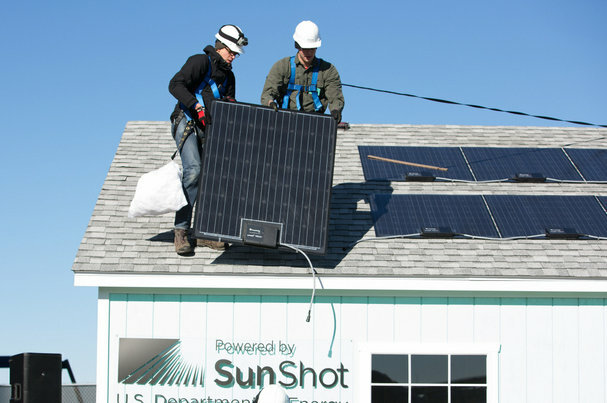 For several years, Fraunhofer CSE has been working with the U.S. Department of Energy, through its SunShot initiative, and other stakeholders on approaches to lowering the cost of installing solar PV, including a “Plug and Play PV” approach designed to reduce the installed cost of solar to $1.50 per kilowatt by 2020, about half of today’s average price. To meet this objective, Fraunhofer CSE and its partners have worked to develop an adhesive-based mounting system that eliminates the need for drilling holes through the roof structure and for electrical grounding, which can save installers several hours of work per site. At TechConnect, Dr. Shukla presented the findings of research addressing concerns that adhesive-mounted solar panels could cause heat buildup, leading to reduced service life of roofing shingles under the solar panels. Dr. Shukla and his team conducted a comparative field study to evaluate the thermal impact of adhesively-mounted rooftop PV on the roof structure. Two identical test hut structures with 12 feet by 8 feet footprint and south facing roof were built and co-located in CSE’s outdoor test facility in Albuquerque, N.M. Adhesive-applied PV modules were installed on one of the roofs, while the other roof served as a reference for comparison. An extensive arrangement of temperature sensors and heat flow transducers was installed on various locations of the PV panels, roof shingles and roof deck to understand temperature conditions and heat flows. The research, presented as “Thermal Influence of Adhesive-mounted PV on Underlying Roof,” found that during summer months, the peak daily temperature of shingles under the adhesive-mounted PV panels was reduced by 5 to 15 degrees Celsius compared to exposed shingles on the reference hut. Average of the daily peak heat flow and cooling demand through the ceiling of the PV-installed test hut were also found to be almost 50% lower than the reference hut.